“Zephon” will be featured prominently on Age of Revolution, IMMORTAL GUARDIAN‘s debut album, which will be released via M-Theory Audio on Sept. 28. 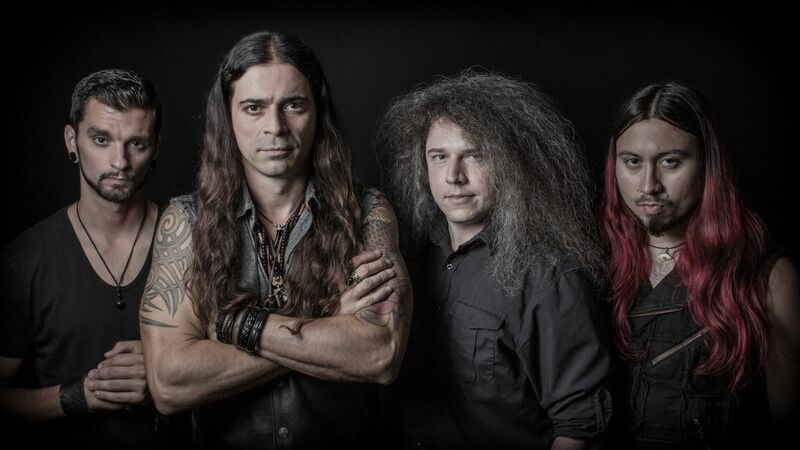 The artwork for the album, featured above, was created by the group’s vocalist, Brazilian powerhouse Carlos Zema (ex-Outworld). The album can be pre-ordered now on Bandcamp and through the M-Theory Audio webshop, with additional digital pre-order options to follow in the coming weeks. This weekend, IMMORTAL GUARDIAN kicks off a series of live dates alongside Exmortus and Hatchet. Additional information on those shows appears below. Hailing from the same state as guitar greats Dimebag Darrell and Stevie Ray Vaughan, IMMORTAL GUARDIAN proudly fly the flag of musical innovation and virtuosity for the Lone Star State. Over the past few years, the group has released two acclaimed EPs, Revolution Part I (produced by Roy Z of Halford/Bruce Dickinson fame) and Super Metal: Edition Z, that showcased a full-frontal metal assault of anthemic melodies, technical rhythms, furious shred and high-flying vocals by Zema. In support of their EPs, the group has made jaws drop on stages in not only their home state – where they’ve performed alongside some of the biggest names in metal, including Judas Priest, Dragonforce, Kamelot, Symphony X, Sonata Arctica, Slayer, Metal Church, Soilwork and Steve Vai – but also abroad in countries such as Brazil and Russia, and during high-profile performances at ESPN’s X Games, South By Southwest and the Fun Fun Fun Fest. Live footage shot during the band’s SXSW showcase last month can be viewed below. In addition, Gabriel Guardian has developed an extensive following on YouTube, where his unique dual-instrument covers of classics by the likes of Iron Maiden, Pantera and Guns N’ Roses have garnered hundreds of thousands of views. His virtuosity was also recently showcased on the MTV program “Amazingness” (watch a clip here https://youtu.be/r8YS9aCr9xg). This summer, Gabriel will tour North America extensively as a guest member of video game metal icons PowerGlove. The tour includes a stop at Austin’s Come and Take It Live in August, where IMMORTAL GUARDIAN will also perform.